USA BASEBALL on July 13, 2016 DURHAM, N.C. - USA Baseball and Major League Baseball (MLB) today announced a five-year extension to its longstanding partnership agreement. The agreement will continue support of national team programs and create a Sport Development department. The department's focus is on the growth and development of baseball at the grassroots level. Since the original partnership was announced in 2006, USA Baseball has thrived with the support of Major League Baseball. 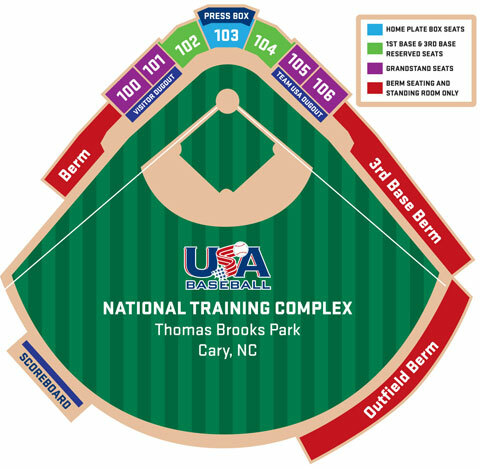 USA Baseball opened the National Training Complex in Cary, North Carolina and has enjoyed tremendous organizational growth, more than tripling the organization's fulltime staff and programming over the last 10 years. Team USA has also enjoyed prodigious on-field success winning 32 gold medals across eight different programs over the duration of its partnership with MLB, including 10 world championships. Additionally, 150 USA Baseball alumni have been drafted in the first round of the MLB Draft, including nine number one overall picks. "As the National Governing Body of the sport, USA Baseball is an important strategic partner in strengthening the amateur and youth levels of our game," said Commissioner of Baseball Robert D. Manfred, Jr. "We have made progress throughout our partnership, particularly with the PLAY BALL initiative, and we look forward to instituting more positive developments in the near future." "Our relationship with Major League Baseball over the past ten years has fueled the growth of USA Baseball in ways none of us ever really imagined", said Paul Seiler, Executive Director and CEO at USA Baseball. "Beyond our many on-field successes, this alliance has enabled our organization to become a true leader and model governing body in the world of sport, both domestically and internationally. We're excited to see where the next five years take this partnership to the benefit of our membership and our national pastime." The partnership also will continue the proliferation of Pitch Smart, a series of practical, age-appropriate guidelines to help parents, players and coaches avoid overuse injuries and foster long, healthy careers for youth pitchers. To date there are 20 fully compliant amateur organizations applying the guidelines and principles across all competitions. Additional programming initiatives include the Online Education Center, the Amateur Resource Center and the USA Baseball Mobile Coach app. USABaseball.Education is the home of the Online Education Center and currently features five educational courses with six more expected to launch this summer. Course hosts include Joe Maddon, Dayton Moore, John Smoltz, Barry Larkin, Dave Roberts and more. The Amateur Resource Center is a library of information featuring articles on baseball skill and development, health and safety, support programs, and championship principles. The USA Baseball Mobile Coach app offers baseball coaches at all levels the ability to plan practices using drills supplied in the application. The app also includes information related to Pitch Smart guidelines, resources and pitch-counting features. Combined efforts between USA Baseball and Major League Baseball on these initiatives place the two organizations at the forefront of the educational landscape for the game of baseball throughout the United States. All of the educational offerings delivered by the Sport Development department are free of charge to the public. USA Baseball will continue its support of multiple programs with Major League Baseball, including Fun at Bat. USA Baseball has also maintained a strong relationship with the MLB Urban Youth Academy system and continues to work jointly with MLB on diversity-driven events that provide exposure to underprivileged amateurs, such as the Elite Development Initiative and the Breakthrough Series. In addition to the expansion of new programs, Major League Baseball will continue to work alongside USA Baseball's sponsorship, licensing and other business areas, which will include collaboration with Major League Baseball Properties. MLB Advanced Media LP (MLBAM), the interactive media and internet company of Major League Baseball, will also support USA Baseball's internet properties highlighted by USABaseball.com and GoldenSpikesAward.com, as well as provide live video streaming support for USA Baseball events.